With the start of the school year comes the start of the football season and the return of the marching bands at area schools. The marching bands have long been a tradition at football games, parades and other performances throughout the years. Pictured here is the Pomeroy School Band. According to the writing on the back of the photograph, it was taken sometime between 1933 and 1935 in Pomeroy. https://www.mydailysentinel.com/wp-content/uploads/sites/14/2018/08/web1_8.30-TBT-Pomeroy-Band.jpgWith the start of the school year comes the start of the football season and the return of the marching bands at area schools. The marching bands have long been a tradition at football games, parades and other performances throughout the years. 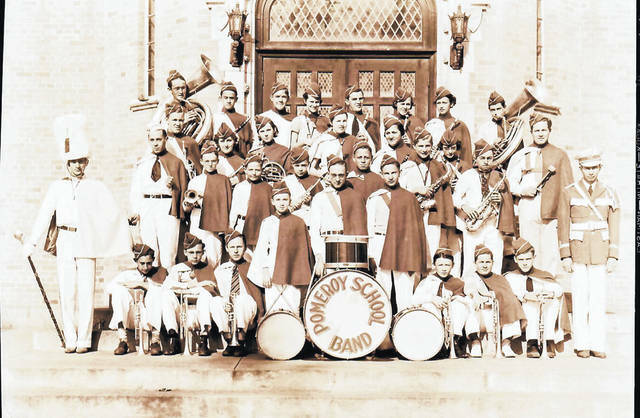 Pictured here is the Pomeroy School Band. According to the writing on the back of the photograph, it was taken sometime between 1933 and 1935 in Pomeroy.